In July 2008 the Institutional Knowledge Sharing (IKS) Project commissioned RE4D.net to conduct an independent evaluation of the first phase (2004-2006) of the Knowledge Sharing project. This study assesses the results of the four pilot activities, illustrates the systemic impact of the project, and presents lessons distilled from the combined experience of KS professionals in six CGIAR centers. The study used semi-structured, open-ended telephone interviews to gather feedback from 14 CGIAR staff and consultants who were involved in the first phase of the KS project or undertook similar initiatives at the same time. This anecdotal feedback was then categorized, allowing for a meaningful analysis of the benefits of the KS project and the challenges it faces. The various initiatives promoting innovation, learning, KS, and change in the CGIAR should develop a common advocacy strategy enabling them to insert key messages into organizational development processes. The aim of this strategy should be to generate commitment at the top end of the hierarchy to those interlinked issues in order to increase impact. The challenge for the KS community is to lower the threshold of KS for first-time users and to change the perception of KS as time-consuming. Furthermore, senior scientists are a powerful constituency with the potential to obstruct new KS initiatives. 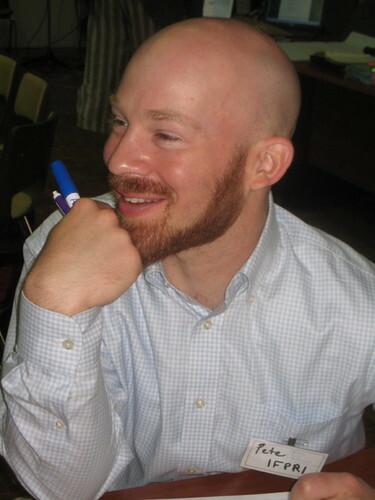 They often have little to gain from KS and other participatory techniques because they already have a voice and a network. To increase senior scientist buy-in and therefore impact the impact of KS, the KS community needs to make more obvious to senior scientists the benefits of the initial investment. The KS community should invest time to define the fundamental concepts of knowledge sharing so as to create a specific body of knowledge on KS and establish it as a separate discipline. 10 Key Lessons summarize the project learnings that have been reinforced and worked upon since then in project phase 2. 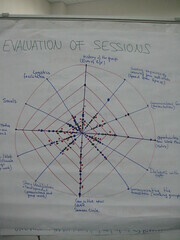 Participant’s Evaluation: We Want to Learn More Tools! 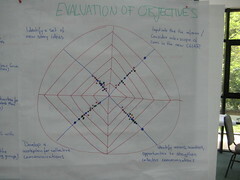 Last but not least we went through an evaluation of the workshop. As a way to share reflections and to crystallize trends, we asked participants to reflect individually and answer three questions, then to share those answers in pairs and finally in groups of four. When asked what was useful for them from the last three days, participants highlighted the relational aspects: Learning with peers, meeting and working with people who have similar problems, networking… those have been primary positive and useful aspects of the workshop. Participants also appreciated learning about methods and tools. The Peer assist methodology was mentioned several times, as well as the hands-on sessions about tools. The second question was about things that our group still wants to learn more about, and this are: tools, tools, and more tools. The use of RSS feeds is a real learning need for many participants. But our colleagues are also intrigued to learn more about some methods, like facilitation techniques, and approaches related to monitoring and evaluation, and impact assessment, specifically of KS approaches. 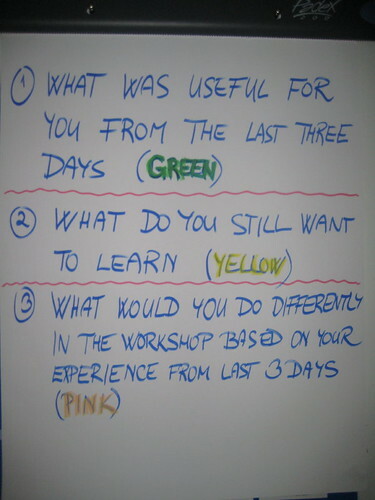 When asked “What would you do differently in the workshop based on your experience of the last three days?” participants gave us the principle suggestion to have more time to explore tools, and if possible hands-on (which requires internet connection ;-). Pete: How Did you like Day 1 of our Workshop? “Our small group discussions worked really well where we went through our projects and we identified pertinent questions, and issues related to each others projects and then from there we went through the SWOT analysis. Doing that collectively was a great exercise.